Posted on Wed, Apr 4, 2012 : 9:54 a.m.
Another far-too-early preseason poll, another lofty ranking for the Michigan basketball program. CBSSports.com released its "Ridiculously Early Top 25 (and one)" poll Tuesday, and the Wolverines are slotted at No. 5 -- three spots behind Indiana and three spots ahead of Michigan State. CBSSports.com's ranks Michigan at No. 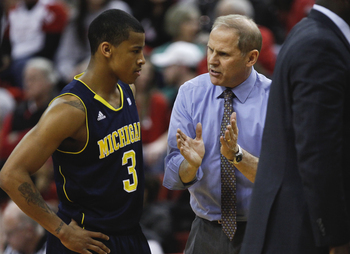 5 in its 2012-13 preseason poll, but that includes an "expected to return" Trey Burke, left. ESPN.com tabbed Michigan as the early preseason No. 8 team in America earlier Tuesday, but didn't take into account possible departures and returnees in its poll. CBS, however, did. With each team, the site listed players that are "definitely gone," "expected to leave" and "expected to return." In Michigan's section, there were no players in the "expected to leave" category, leaving Wolverine point guard Trey Burke in the players "expected to return" group. Burke is currently weighing his options on whether to return to Michigan for his sophomore season or enter the NBA draft. Wed, Apr 4, 2012 : 5:55 p.m. If Burke stays, I think Michigan is a top 10 team. I don't know if I would put them at #5 even with Burke, but I would least accept it as a possibility. If he bolts, no way. Wed, Apr 4, 2012 : 5:45 p.m.